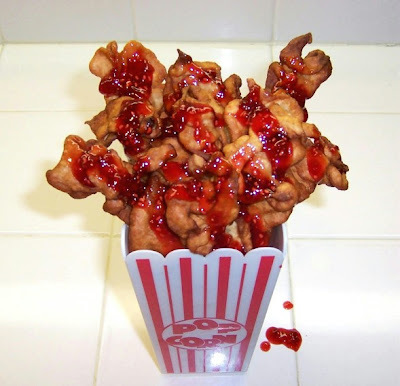 Girl Is Poison: "Blood and Guts"
This is a recipe that I came up with when I wanted to make something gross looking, yet tasty for my Halloween party. The taste is similar to Churros, which is a Mexican snack pastry that is deep fried. Enjoy! 1) Mix strawberries and raspberries in a bowl and crush them. Set aside. 2) In a small sauce pan combine berries and sugar and cook on med/high heat until mixture begins to bubble. Make sure to stir frequently. 3) When mixture is bubbly turn off the heat and continue stirring until it cools and reaches a syrupy consistency. To make your sauce thicker add more sugar little by little until it looks the way you want. To make it thinner add water little by little until it’s where you want it. 1) Sift together flour, baking powder, salt, cinnamon, nutmeg and clove. Set aside. 2) Combine sugar and butter in a large mixing bowl. 3) Add egg, vanilla and apple sauce. Stir in completely. 4) Little by little add dry ingredients and mix them in. 5) Add milk a little at a time until the mixture reaches a thick “pancake batter” consistency. 6) In a large pot heat about 3-4 inches of vegetable oil on med/high heat. 7) When the oil is hot, use a ladle to pour small amounts of batter into the pan in elongated “intestine like” shapes. This make take some practice, but you’ll get it. 8) Cook “Guts” until golden brown and use tongs to flip them over and finish the other side. 9) Once both sides are golden brown remove them and place them on a paper towel to drain. 10) Serve with “Blood” sauce drizzled on top or on the side if you prefer. If the sauce has thickened too much, add a little water. You can make an easier, quicker version of the “Blood” sauce by heating strawberry jam with a little water and pouring it through a strainer. Make the “Blood” sauce first as the guts are best as fresh as possible. This also gives the sauce time to cool and thicken. You can make “Worms in Dirt” by substituting the “Blood” sauce for crumbled chocolate cookies and chocolate syrup. OOh, so it tastes like Funnel Cake more? =D I gotta try it!